Chairs ran backward at twice the normal speed, flinging riders off the lift and hospitalizing at least eight. 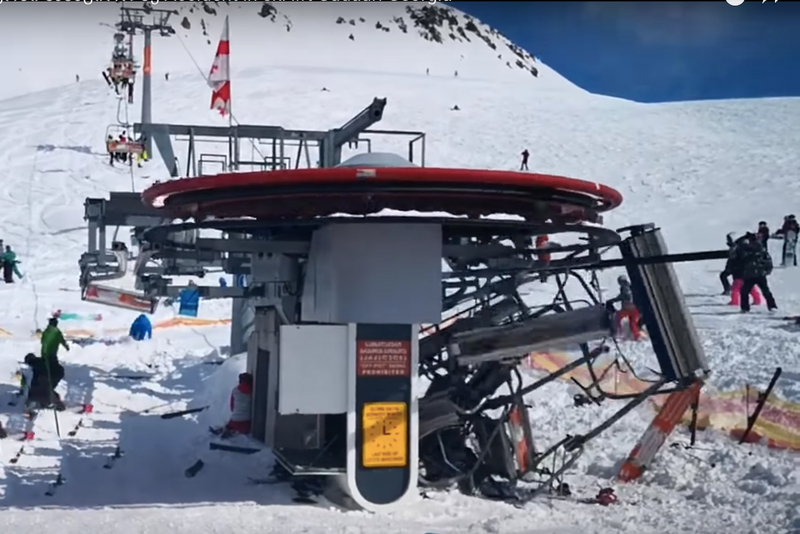 Skiers and boarders at Gudauri Ski Resort in the Caucasus Mountain Range in Eastern Europe were subject to a horrifying chairlift incident on March 16. Watch the videos above and below to see the ordeal. The lift at the Georgian ski resort reversed direction and at least doubled in speed, sending riders hurtling to the ground in the process. From the video, it appears riders attempt to jump off before the chair swings violently around the the bottom of the lift. “People were left ‘shaken and shocked,’ as the ski lift threw people off their seats and into the snow,” reported the Georgia Today. According to a report from the Georgian news platform Agenda, one of the injured was a pregnant woman from Sweden who has “pain in the waist” as a result of the incident. Another individual from the Ukraine suffered a broken hand and a “light injury on the head,” according to the report. Meanwhile, conflicting reports cite the total number of injured between eight and 12. The resort did not report any serious injuries. According to Agenda, the Mountain Resorts Development Company, part of the Georgian Ministry of Economy and Sustainable Development, immediately contacted the lift’s manufacturer, Doppelmayr Garaventa group, to determine the cause of the accident. The resort issued a statement on its Facebook page promising to reimburse all medical costs for the injured. The Gudauri Ski Resort lies in the northeast part of the country of Georgia, high above the tree line. Gudauri has 35 miles of ski runs across seven lifts. The resort also offers heli-skiing, ski touring, speedriding, and paragliding.